Posted on 14, December 2015 by EuropaWire PR Editors | This entry was posted in Government, Healthcare, Pharma & Biotech, Switzerland and tagged lung cancer, Roche’s Alecensa®, US FDA. Bookmark the permalink. BASEL, 14-12-2015 — /EuropaWire/ — Roche (SIX: RO, ROG; OTCQX: RHHBY) today announced that the US Food and Drug Administration (FDA) granted accelerated approval to Alecensa® (alectinib) for the treatment of people with anaplastic lymphoma kinase (ALK)-positive, metastatic non-small cell lung cancer (NSCLC) who have progressed on or are intolerant to crizotinib. In the pivotal studies, Alecensa shrank tumours in up to 44 percent of people with ALK-positive NSCLC who progressed on crizotinib (objective response rate [ORR] of 38 percent [95 percent CI 28-49] and 44 percent [95 percent CI 36-53]). In a subset of people with tumours that spread to the brain or other parts of the central nervous system (CNS), Alecensa shrank CNS tumours in about 60 percent of people (CNS ORR of 61 percent [95 percent CI 46-74]). Possible serious side effects with Alecensa include liver problems, lung problems, slow heartbeat, muscle pain, tenderness and weakness. The most common side effects of Alecensa include tiredness, constipation and swelling in the hands, feet, ankles and eyelids. The FDA’s Accelerated Approval Program allows conditional approval of a medicine that fills an unmet medical need for a serious condition based on early evidence suggesting clinical benefit. The indication for Alecensa is approved under accelerated approval based on tumour response rate and duration of response (DOR). Continued approval for this indication may be contingent upon verification and description of clinical benefit in confirmatory trials. In addition, Alecensa is being studied for use as an initial (first-line) treatment for people with advanced ALK-positive NSCLC. ALEX is a global, randomised phase III study comparing Alecensa to crizotinib as an initial treatment for people with advanced NSCLC whose tumours were characterised as ALK-positive by a companion VENTANA ALK (D5F3) CDx Assay immunohistochemistry (IHC) test developed by Roche Diagnostics. This study is part of the company’s commitment to convert the current accelerated approval in people with ALK-positive, metastatic NSCLC who have progressed on or are intolerant to crizotinib to a full approval as an initial treatment. Study 1 is a phase II North American, single-arm, open-label, multicentre trial evaluating the safety and efficacy of Alecensa (600 mg orally twice daily) in 87 people with ALK-positive NSCLC whose disease progressed on crizotinib. 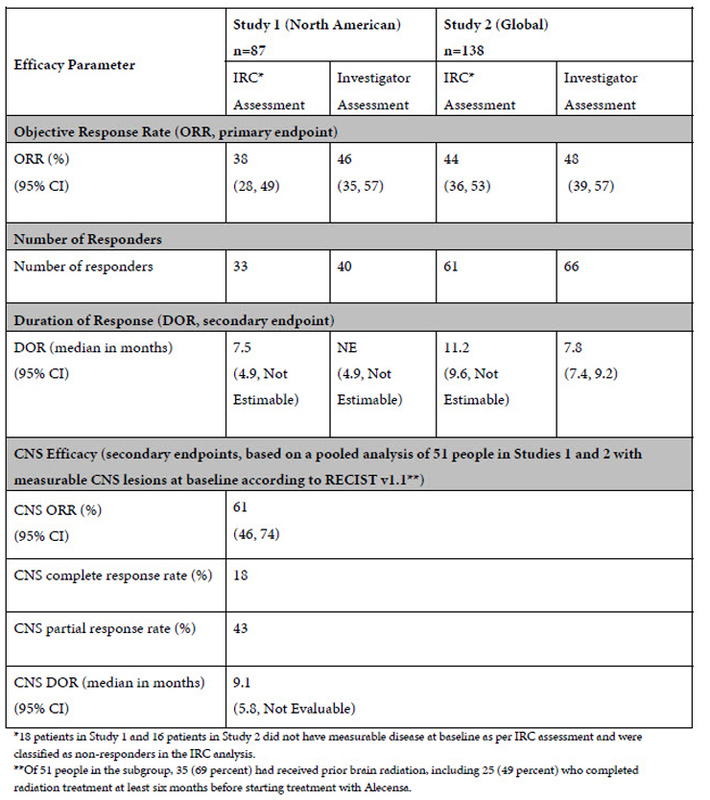 Study 2 is a phase I/II global, single-arm, open-label, multicentre trial evaluating the safety and efficacy of Alecensa (600 mg orally twice daily) in 138 people with ALK-positive NSCLC whose disease progressed on crizotinib. People in the phase II studies received 600 mg of Alecensa orally twice daily. In both trials, the primary endpoint was ORR according to Response Evaluation Criteria in Solid Tumours (RECIST v1.1), as evaluated by an Independent Review Committee (IRC). Secondary endpoints included DOR and efficacy against disease that had spread to the CNS (CNS ORR and CNS DOR). A summary of the efficacy and safety data from both studies that support this approval is included below. The most common Grade 3 or higher adverse events in the pooled analysis of both studies were an increase in muscle enzymes (creatine phosphokinase; 4.6 percent), shortness of breath (dyspnea; 3.6 percent), increased liver enzymes (aspartate transaminase; 3.6 percent, and alanine transaminase; 4.8 percent), evidence of liver dysfunction (hyperbilirubinemia; 2.4 percent), increased blood glucose (hyperglycemia; 2 percent), decreased levels of minerals (hypokalemia; 4 percent, hypophosphatemia; 2.8 percent, and hyponatremia; 2 percent), decreased red blood cells (anemia; 2 percent) and decreased white blood cells (lymphopenia; 4.6 percent). Alecensa (RG7853/AF-802/RO5424802/CH5424802) is an investigational oral medicine created at Chugai and is being developed for people with NSCLC whose tumours are identified as ALK+. ALK+ NSCLC is often found in younger people who have a light or non-smoking history. It is almost always found in people with a specific type of NSCLC called adenocarcinoma. Early studies with Alecensa have shown activity on brain metastases, indicating that the drug may be taken up in the brain. The brain is protected by the Blood-Brain Barrier, a network of tightly joined cells that line the inside of the blood vessels in the brain and spinal cord. One of the ways the Blood-Brain Barrier prevents molecules from affecting the brain is to actively eject them from the barrier through a process known as ‘active efflux’. The active efflux system does not recognise Alecensa, which means that it may travel into and throughout brain tissue. The Global phase III studies of Alecensa include a companion test developed by Roche. Alecensa is marketed in Japan by Chugai Pharmaceutical, a member of the Roche Group. Lung cancer is a major area of focus and investment for Roche, and we are committed to developing new approaches, medicines and tests that can help people with this deadly disease. Our goal is to provide an effective treatment option for every person diagnosed with lung cancer. We currently have two approved medicines to treat certain kinds of lung cancer and more than ten medicines being developed to target the most common genetic drivers of lung cancer or to boost the immune system to combat the disease. In 2014, the Roche Group employed 88,500 people worldwide, invested 8.9 billion Swiss francs in R&D and posted sales of 47.5 billion Swiss francs. Genentech, in the United States, is a wholly owned member of the Roche Group. Roche is the majority shareholder in Chugai Pharmaceutical, Japan. For more information, please visit roche.com.